Who said Ibiza is just for partying? Although it may not be the first place you’d think of for a family holiday it doesn’t mean that the entire island is thumping with partygoers. In some parts of Ibiza, the nights might well belong to parties but there are still plenty of things to do in Ibiza by day. 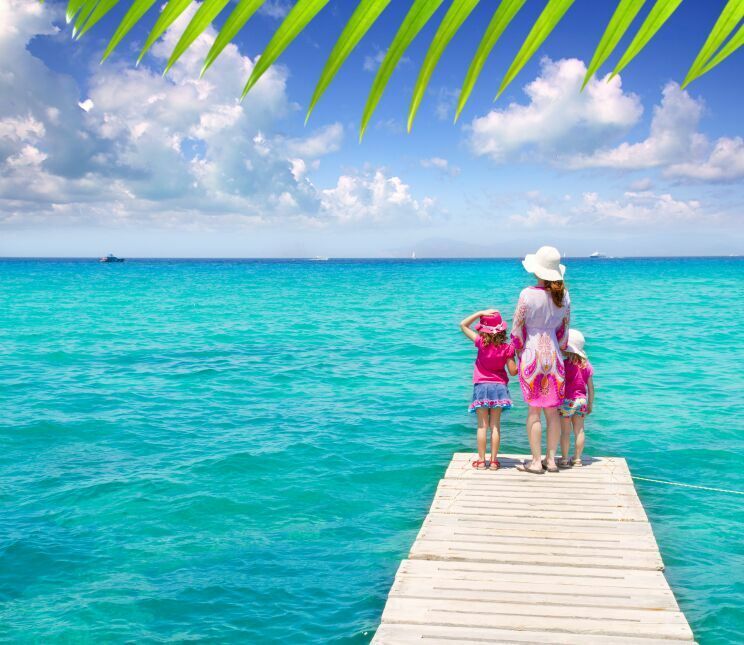 One of the Mediterranean’s most popular islands is waiting to be discovered by you and your family! We’ve put together some useful ideas on things to do with kids of all ages in Ibiza. This is an obvious choice for very good reason and Ibiza offers plenty of hidden child-friendly beaches if you’re happy to head out and explore a little. Some beaches have sandy shelves gently sloping into the sea, making it safer for little ones to play in the shallow water. You will also find that facilities such as lifeguards, showers and beachside restaurants are readily available, as well as beach clubs complete with children’s activities. For the more adventurous, there are sailing boats, banana boats, waterskiing and diving schools for all ages. Try Cala Llentrisca (just past Es Cubells on the southwest side of Ibiza) for off-the-beaten-track tranquillity, or stretch out on the secluded Sol d’en Serra beach near the popular Cala Llonga. There’s also the family-friendly beach at Portinatx which is close to shops, amenities and attracts plenty of fellow tourists with families. If you’re looking for more seclusion you could jump in a hire car and discover your own stretch of sun-soaked paradise. The Telegraph gives further information on what to expect from Ibiza’s beaches. If you’d like to get off the sand for a while you’ll find this spectacular water park behind the popular Playa d’en Bossa beach. Just ten minutes from Ibiza town it is the largest on Ibiza and one of the island’s top family attractions – don’t miss it! The park’s exciting range of water slides is there to keep the entire family happy all day, for the smaller children there are toddlers’ slides, a kids swimming pool and picnic areas. If you prefer to take it easy while the kids play, simply kick back by the pool and enjoy the sunshine as well as the excellent bar and café facilities. Open daily from 10am to 6pm. Just outside San Antonio you’ll find the magnificent Cap Blanc Aquarium. Not your usual aquarium, this is unique in that its main exhibit is a large natural cave topped by walkways where you can get close-up on octopuses, rays and an abundance of brightly coloured fish in addition to a huge range of other Mediterranean wildlife in its natural environment. There’s also a café and bar on the terrace for everyone to enjoy a breather and a well-earned drink or ice cream while lapping up the sun and admiring the views. There’s plenty for all ages in Ibiza in terms of sporting adventure. You can dive, windsurf, sail, parasail, banana-boat ride and hire pedalos at many of Ibiza’s beaches. San Antonio is a great place to kick off your family water sports adventures and you’ll find numerous sporting schools and guided boat trips available from here. San Antonio’s Flowrider is the main attraction at Surf House Ibiza, the beach and sports club which sits directly on the seafront. Amongst other activities like learning to paddle surf or play volleyball, Flowrider is a ride like no other and children aged 14 and under are especially welcome for morning rides. It’s an artificial wave machine, designed in California to accommodate up to 20 riders at a time. No matter what your level of experience you can enjoy the thrill of riding the waves with monitors and surf teachers on hand to assist at all times. Boats Ibiza rents out jet skis, speed boats, motor cruisers, sailing boats and luxury yachts, either for a full day or half a day. Opt for a commercially qualified skipper and they will share their extensive knowledge of Ibiza’s coastline and will tailor the day according to your wishes… they also know all the best places to stop off for a bite to eat, adding that special insider knowledge to your Ibiza holidays! Take off Ibiza not only rents out boats of all kinds, you can go parasailing too. Float wild and free in a parachute and you’ll witness some of the most incredible and exciting views of the island. A discounted price is available for 10-16 year-olds. You can choose from single, tandem or group rides taking you up to 400 metres high above the sea and shoreline. If you’re feeling extra brave, you could even take a daredevil dip in the sea while still hanging from your parachute. Meanwhile, on board, there’s plenty of music and drinks to keep you entertained. Just off the San Jose road, Minibiza is a fun place to spend the day amid the child-friendly, colourful surroundings of a smart, multilingual country club and its great gardens. Children love to play in the especially adapted indoor and outdoor areas and there are several workshops for them to get stuck into new games and crafts. Meanwhile, parents and grandparents are free to go off for an hour or two to recharge and do their own thing, or stay for something to eat or drink in the club’s pleasant surroundings. The Acrobosc assault course sits amid gorgeous, green pine trees with rides to challenge both young and old. Two circuits (one for over eights only), 39 platforms, 43 obstacles and 16 zip wires mean you can enjoy hours of fun showing off your latest hanging and balancing stunts. Try Spain’s first ever Air Zone Park with its giant orbs, which transport you over the water, or along a long slope – this is completely unbalanced, hilarious fun for all ages. Bumperballs are popular with the little ones who play like crazy things, rolling over inside the balls in safety and fun. There’s also go-karting at Santa Eulalia with its diverse range of karts, from slower karts for infants to much quicker 400cc versions for adults, as well as everything in-between. If you’d like to explore Ibiza on foot then there’s plenty of hiking to be done. Try the route from San Antonio Town Hall to Cala Salada for a healthy and picturesque 12.3km saunter of around three hours. Sights to look out for on the way include San Antonio Harbour, Sa Conillera, S’Illa des Bosc, Cap Nono and Sa Punta Foradada. Finally, if you’d like to spend the day taking in unadulterated nature, why not get on a horse at the large, professionally run Can Mayol stables and take a trek though woodlands and along the picturesque coastal trails. Rides go via restaurants with horse-friendly gardens or you could have a picnic delivered right to you along the way. Sunday is kids’ day. The truth is, family-friendly holidays are popular and fun in Ibiza. Exciting, new family activities are popping up on the island all the time, so forget the age-old party image, this sun-kissed Spanish island really has something for everyone.